« What makes a good speaking exam? After the 2016 US presidential elections, much has been talked about cyber security, influence operations and what states do to counter it. This seminar will examine the recent international developments, as well as Armenia’s perspectives. Particular attention will be paid to the topic of cyber diplomacy – the international engagement of states in the field of cyber security. 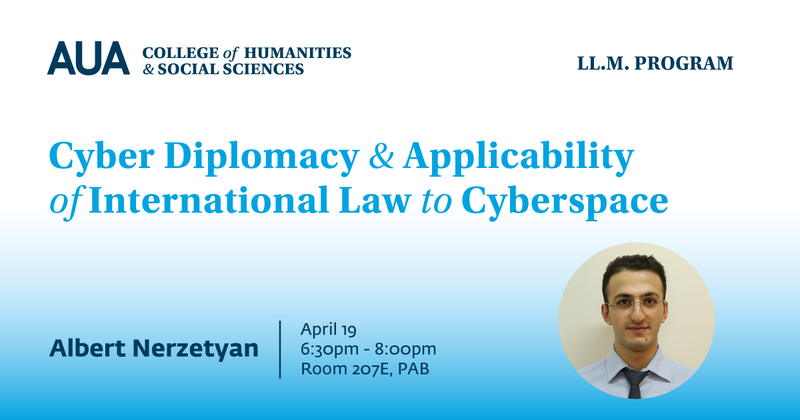 The seminar will seek to answer the questions of international humanitarian law applicability to cyberspace, the applicability of norms of responsible state behavior and lastly will present how the Western countries and Russian/China differ in their interpretation of international law applied to cyberspace. Albert Nerzetyan graduated from the Department of Political Sciences and International Relations at the University of Toronto in 2014. Upon graduation, he joined the Armenian army as a junior researcher at the National Defense Research University. In 2017, Mr. Nerzetyan completed a Master of Laws (LL.M.) degree from the American University of Armenia. Over the past four years, he has worked at different government agencies in the field of cyber security policy development. In 2018, Mr. Nerzetyan completed the Program on Cyber security at the George C. Marshall Center, European Center for Security Studies.